Aurangzeb's mosque, Benares (U.P.) seen from the river. 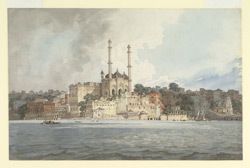 bl.uk > Online Gallery Home	> Online exhibitions	> Asia, Pacific and Africa Collections	> Aurangzeb's mosque, Benares (U.P.) seen from the river.